Gold IRA GuideFederal Reserve Has Gold priced in next rate hike? Has Gold priced in next rate hike? Last Wednesday after the Fed meeting comments by Chairwoman Yellen of a possible interest rate hike Gold price turned lower by more than $30. Gold price traded above $1182.00 to the ounce before the Fed announcement, an hour after the statements by Yellen it had already hit $1152.40. The down trend has continued since then, although at a slower rate, as price is now hovering around $1138.00 to the ounce. Clearly the possibility of a higher rate scenario is what is scaring the market, as investors will be attracted to assets that pay coupons. There had been calls of a new Bull trend when Gold rallied above its 200 day moving average on October 14, the idea being that a future interest rate hike had already been priced in. Considering the most recent market movement that was probably not the case, in fact it was most probably due to the relatively poorer economic data and more doveish comments from the fed. But the question remains, after the last drop in price after the last Fed meeting, as to whether the market has priced in the next likely interest rate hike. Given the sharp downward move it will be interesting to see if price stabilizes around these levels. Gold withdrawals may indicate how investors are perceiving risk as holding Gold in your own safe would seem to offer more protection in the case of an extreme crisis. Governments in Europe and elsewhere are withdrawing Gold holdings from New York Fed vaults, more than 200 tonnes have been withdrawn during the past year. This is a substantial increase and tells a very interesting story as to how much faith foreign governments have in the US being able to guarantee their holdings in Gold. It's worthy of note that Gold redemptions were halted in November 2008 at the height of the crisis. From the chart below we can see how Gold withdrawals began heavily in 2007 at the first signs of the sub-prime crisis, fell heavily through to November 2008 when they where stopped. Withdrawals are also on the rise in China, 57 tonnes of gold bullion were withdrawn from the Shanghai Gold Exchange, according to latest data, in one week. Total withdrawals have risen to over 10,000 tonnes, and withdrawals for this year at week 41 of 2015 are at 2,119 tonnes. This figure already surpasses the previous record high withdrawals for a whole year of 2013 which was 1783. The data does not include flows that may go through Hong Kong or the Peoples Bank of China. 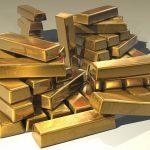 It would seem governments and individual investors are increasing their demand for holding physical Gold. In 2006 the CFTC started collecting data on traders positions, the so called “Commitment of Traders”. This data includes Long, Short and Spread positions, for speculators and hedgers. Hedgers are considered as being producers or consumers of the commodity, like Gold mining companies or jewellery makers. The speculators are the asset managers and hedge fund managers that place directional trades on Gold using Futures contracts. As of the latest week's data for October 27 Long and Short positions for Managed Money show Long positions holding 147,660 contracts compared to 33,568 Short contracts. The positive difference between Longs and shorts has been rising for 5 straight weeks in a row, with net longs being at their highest since February. The CFTC also supplys the number of traders with Long and Short positions, which are 79 and 25 respectively. The number of traders helps understand whether there is a majority consensus or if the Long positions are concentrated in the hands of a few very large funds. The data used to compile the chart for Net Positions is for Managed money Long and Short data from the CFTC. The above chart compares the price of Gold SPDR (GLD) with the net Long/Short positions of the Money Manager category from June 2006 to December 2014. We can clearly see the rising trend in Net positions as Gold rallied from 2006 to its high in 2011, this is denoted by higher highs and higher lows throughout the period. In a similar but opposite fashion the Bear trend that followed in Gold was also accompanied by a falling trend in Net positions, as can be seen by lower highs and lower lows. This appears to have changed since the record low of Net 9,941 Longs in December 2013. We can now see Net positions showing higher highs and higher lows through to the end of 2014, where it reached 87,050 Net long contracts. Latest data shows a net long position of 114,092, coming from 5 consecutive weeks of gains, it would seem the rising trend for net long positions in Gold is still in tact.